New Power Supply Build, Reached Some Problems and Need Some Help. here is a schematic of one of the simpler ones I'm going to try this one again. I hope you do not mind me asking but could you tell me how you designed your board art? I am wondering if maybe you try a few things I find helpful if your designs couldn't come out a little clearer. Probably be a little easier for you to build too. Now I'm not saying that my design is the have all and end all or if it is even right the way as it is. I merely offer it as an example of something closer to better? Like you say it is a simple circuit so it should look simple. Maybe it'll help you out some as you go along? I know it'd have helped me out when I was first starting. Anyhow good luck and keep at it! P.S. The software can even make more complicated circuits "simple" if you really spend some time fiddling around with it. There are tricks you pick up as you use it. That eagle stuff is nice you can do work with. its hard to learn but once you get the hang of it its really nice. Eagle is OK. I've used other CAD schematic software I thought was harder to work with. I'd like to find a free open source alternative to Eagle someday but so far what I've tried hasn't worked for me. Try http://TinyCad.com Very Easy to use and Free. Use v.2.60.01 it works for me. http://TinyCad.com TinyCad electronic schematics drawing from SourceForge. Free. 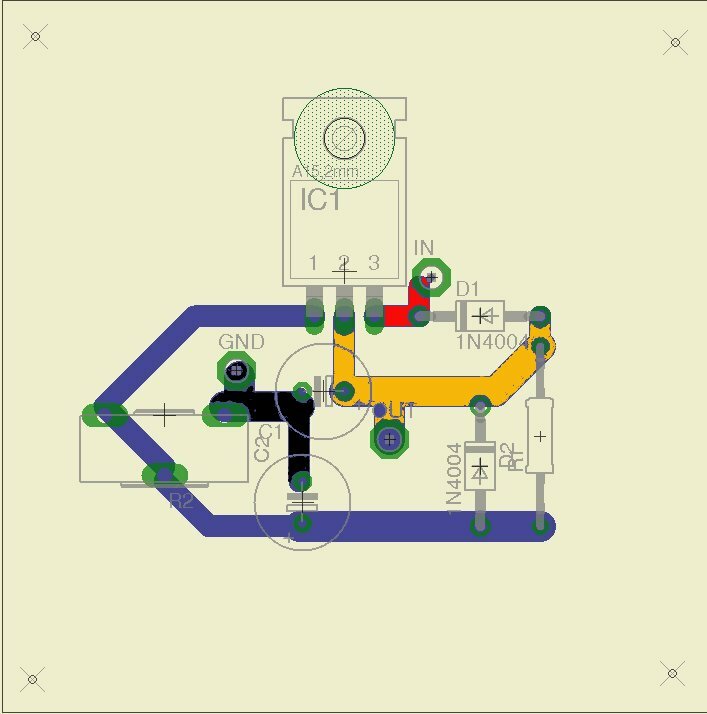 Its called TinyCad 2.60.01 works best for me and has everything eagle has. Easy to learn and Free. Even has SpiceFiles and you can add to the parts to the Library. Did I mention its a Free Open Source Cad Program and Easy to use? If your input voltage to the regulator is 10 volts above the desired output and mattthegammer is right. Do you have a big heatsink on that voltage regulator because it will produce a lot of heat. They are designed to operate in the safe region and when they get too hot, they will cut back on the current. There is an overall current limit the chip is capable of producing (assuming you have a really good heatsink to keep the chip cool), probably less than 1.5 -1.8 Amps. So you are doing really good to get 1.8! what are the pieces you used to get that 24v @ 1.8amps? This is a linear regulator. It dissipates power to lower the output voltage. So.... For 5A maximum rated output, lets say ideally you're regulating 35V down to 33.5V. That's only 7.5 watts being dissipated by the regulator. In other words, if this parts says max current is 5 amps, and minimum overhead voltage is 1.5V, it's really telling you that its maximum heat dissipation is 7.5W. Don't be fooled by a current rating. If you try to drop output down to 5 Amps @ 1.5V, you're looking at 167.5W, which is way, way, way more than the 7.5W maximum. This is just not going to be sustainable for more than a fraction of a second without some pass transistors, a decent heatsink, and a fan. -And tell us in detail how things don't work. You know that if you're dropping voltage, the rest of it gets wasted as heat? You really shouldn't have posted this as a Instructable, since it isn't a guide. You should have put it into the community forum. One thing I see, you used a 4700uF cap rated for 35V for actual 35V, didn't you? That value is a maximum rating, not a run-at-this value. Its very much frowned upon, and in your case, could be dangerous with that much current. Take a look at page 11 of the LM338 datasheet, it says that for the 0V to 22V regulator it demonstrates, max current is unattainable at higher voltages. 24V x 5A = 121 watts of available power,thats a lot to ask of the chip, I think. 35V 10A too, be careful with that please. That'll fry your heart faster than you can think about it.